WAUSAU, Wis. (WSAU) -- State Democrats say they have better solutions to the student debt crisis than their Republican counterparts. Both parties are talking about the issue, but like most issues, they haven't agreed on how to solve the problem. Two central Wisconsin Democrats were in Wausau Friday for a listening session to hear what students and school officials had to say. 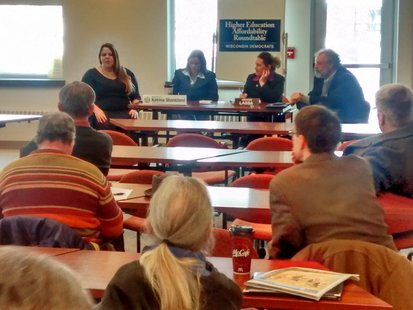 About 30 people were at the UW Marathon County Campus for the Higher Education Affordability Roundtable, as Senator Julie Lassa and Representative Katrina Shankland discussed proposals the minority party has put forward, and to hear the personal stories of those affected by student debt. Lassa says this is a really big issue to a lot of people in Wisconsin. "We heard from a number of folks today that when they graduate, they'll have 40 and 45-thousand dollars in student loans to pay off, and that is a huge hurdle for people who are trying to live the American dream." Lassa says students today have two problems. Education cost is up, and financial aid is harder to get. "It's much more expensive in the State of Wisconsin now to get a higher education. It's taking longer as well, especially since students are not able to get into the classes that they need to graduate on time, so that delays them a semester or two, which just adds on to that debt and the cost of that higher education." State Representative Katrina Shankland says Democrats have been pushing the Higher Ed Lower Debt bill for about three years, and believes Republicans should join them to pass this bill. "Our bill is a free market solution that doesn't cost actual money once it gets started. It's a bonding program, so actually, the state would make money over time while saving the people of the state with student loan debt hundreds of dollars if not thousands of dollars a year in tax deductions and lower interest rates." Lassa agrees, saying students need the ability to shop around for better loans. "We've put forward one that is based on the free market. Allow graduates who have student loan debt to be able to go out and refinance, just like you can your mortgage, or your car loan, or credit card debt." Shankland says refinancing now is against the law for student loan debt. "The federal government does not allow it, so states like Connecticut, Minnesota, and Rhode Island have passed solutions within their states to allow refinancing in that state alone. Ideally, the federal government would allow refinancing." Lassa says their bill would also allow people to write off their taxes for their interest as well as their student loan payments. The two central Wisconsin Democrats say the state pays about 15% of the cost of higher education now versus nearly 60% a couple of decades ago. Because of that, students are financing most of their education. There has been discussion of the debt issue on the Republican side of the aisle since the Governor's State of the State address, but Shankland believes the Republicans are only talking about student loan debt because it's an election year and because poll numbers are down. She criticizes them for cuts to education and UW funding. Shankland claims the refinancing bill would be cost neutral to the state, but another one of her proposals would have to be paid for by the budget. "I have a bill to give 33,000 technical college students and 15-hundred UW students who qualify for financial aid but didn't get any because Republicans voted against them in the budget the financial aid they deserve. We have a Democratic bill to allow everyone with student loan debt to refinance. Those are the solutions that we want to see." It's unclear where those dollars would come from, as the Governor and the Legislature have already indicated Wisconsin is likely to have another lean budget next time around.